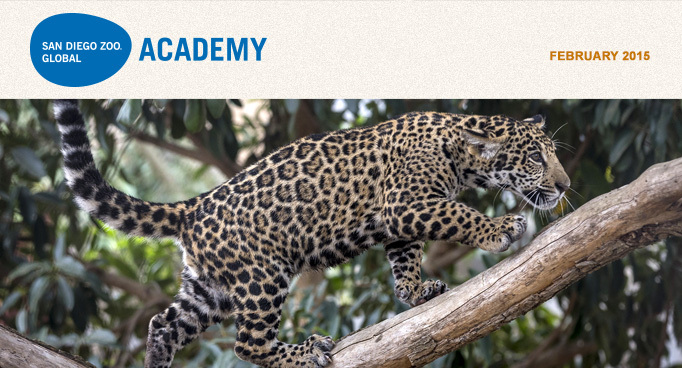 Leap into the world of felines as the San Diego Zoo Global Academy presents its newest module in the Introduction to Animal Species series: Cats. 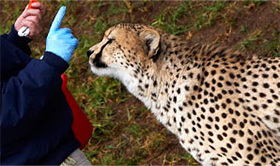 Offering insights to keepers, interpreters, guides, and docents, the module contains six sections focused on natural history and behavior of this Felid family. Along the way, it answers such commonly asked questions as, "Why can some cats roar?" and "What cats are considered big cats?" as well as covering timely issues concerning cat conservation. Cats offers stunning photographs, audio tracks of cat vocals, original videos, and interactive quizzes to engage the learner through the content. Quick quiz questions at the conclusion—with immediate scoring and review—let the learner assess self-knowledge while building confidence when addressing guest questions about cats. The module takes about 90 minutes to complete, although learners progress at their own pace and may repeat the entire course or sections of the course as many times as they like. This course joins others in the series including Great Apes, Polar Bears, and Gorillas, along with Cheetahs, Lions, and Tigers. So pounce on this opportunity and open the newest Introduction to Animal Species module. You'll have a roaring good time. Click here to view a sample of the new Cats course. Our goal is to have a monthly communication meeting in which we provide all administrators with updates and training on our learning management system processes, features, and tools. We also look forward to hearing from you on topics that you feel would be useful and educational as we create agendas for future meetings. Please join us for our February meeting! The Knoxville Zoo in Tennessee has joined the Academy's collaborative learning environment with their privately branded custom sites (one for their employees, one for their volunteers). Welcome! The International Association for Continuing Education and Training (IACET) has awarded CypherWorx, Inc. (Academy partner) the prestigious Authorized Provider status. IACET Authorized Providers are the only organizations approved to offer IACET Continuing Education Units (CEUs). The recognition period extends for five years and includes all programs ordered or created during that time. In order to achieve Authorized Provider status, CypherWorx completed a rigorous application process, including a review by an IACET site visitor, and successfully demonstrated adherence to the ANSI/IACET 1-2007 Standard, which addresses the design, development, administration, and evaluation of its programs. CypherWorx has pledged its continued compliance with this standard and is now authorized to use the IACET name and Authorized Provider logo on promotional course material. In addition, CypherWorx is now linked to the IACET web site and is recognized as offering the highest quality continuing education and training programs. Here is a sample introduction to an e-mail that we send to our new or recently promoted employees, prior to their first day of work. I also provide instructions for signing on and accessing the courses. "Welcome to San Diego Zoo Global! You can begin taking your required Animal Care courses after you complete any necessary paperwork with the Human Resources Department. If this changes, you will hear back from our Human Resources team." Check out the Blended Learning webinar in your Academy course catalog! How do you effectively take a tired old lecture series or outdated formalized training and turn it into a vibrant and engaging program perfect for your audiences? For most organizations, blended learning is a MUST. In this webinar, follow our journey from investigation to implementation of training for a variety of volunteer assignments. Explore a multitude of techniques to teach a broad range of learners effectively and efficiently. Once you complete the webinar, be sure to inquire about the Academy's DIY options, so you can tailor your own personal training and add it to your SDZGA repertoire. In the Bloodborne Pathogens course created by Michael W. Keefe, CSP, MBA, CWCP Environmental, Health, and Safety Professional, you will learn about the characteristics of bloodborne pathogens such as HIV, diseases caused by these pathogens, and how they are transmitted. You will also learn the elements of an exposure control plan and how to prevent contact with or infection from contaminated body fluids. In addition, you will learn how to handle exposure incidents involving blood, as well as the signs, labels, and color-coding used to warn of biohazards and bloodborne pathogens. This training is provided to help employers provide a safe and healthful work environment for their employees and minimize the possibility of employee exposure to bloodborne pathogen. Bloodborne pathogens are infectious microorganisms in human blood that can cause disease in humans. These pathogens include, but are not limited to, hepatitis B (HBV), hepatitis C (HCV), and human immunodeficiency virus (HIV). Needle sticks and other sharps-related injuries may expose workers to bloodborne pathogens. Workers in many occupations, including first aid team members, housekeeping personnel in some industries, nurses, and other healthcare personnel may be at risk of exposure to bloodborne pathogens.